I am putting it out there that I’d like someone to accompany me to churches on a Sunday morning. My new church visit speed has hit a new low and I’d like to find a way of not stopping together. If anyone would like to come along to any church I haven’t yet visited please let me know and we will plan it. I am discarding the rule of ten miles as well as the need for any particular order. I am ok with a one time partner or longer term. I just find myself wanting some new motivation. I also decided some time ago to accept invites to someone’s home church. I prefer to drop in unannounced but I can be ok with a more solid plan. I’m just looking for idea to keep the project interesting. Well, they sit, mostly quietly for about an hour. No, for real. And it actually wasn’t too bad. It’s a time for listening to see if God is going to speak to us. If anyone has a message they consider good for sharing they share aloud. 1) Someone spoke about feeling welcome and having been given coffee that was exactly the way she liked it. This really seemed to have made her happy. 2) Another person said some remarks the Pope made were along the lines of God having given up some of his power in creating us. Some of the power is in us. I tried to look up these remarks for reference but was unable to find them. The Pope says a lot of things I guess. 3) A visiting Quaker Friend? Quaker?….anyway, a visitor felt led to make the effort to find a local Friends Meeting and things just seemed to fall into place allowing her to be here on time. 4) One person observed that it’s amazing we are in what’s called the ‘goldilocks zone’ where life is possible. After approximately an hour we all greeted each other then there was sharing of announcements as well as the standard joys and concerns. I stayed a long time talking with members of the congregation about different things. I guess I really liked it. I say I guess because I can’t figure out why I liked it so much. It’s difficult to sit mostly still and quiet for an hour. But then again, I often like things that are a little difficult. It makes me feel like I’m accomplishing something worthwhile. I’m drawn to the fact that Quakers don’t have much doctrine going on. They seem to believe that God speaks to (or potentially speaks to) everyone equally. This is nice. I’m going to have to learn more and probably write more. Church name/type: This is a branch of the Church of Jesus Christ of Latter Day Saints. Called Mormons by some. (Not to be confused with fundamentalist Mormons who allow multiple wives to one husband) This church is called the Albany Second Branch. Pastor: There is no pastor. They call that job Branch President. I did not write down his name. Very unusual. The Sunday morning gathering can be called a service, but seems to be more commonly called a sacrament meeting. It had the usual components: songs, announcements, scripture, prayer. The communion (if that’s what they call it) was different in that it featured bread and water (vs. wine or juice). The sacrament meeting itself was odd to me because it was dead silent for the bread and water, but sort of full of noisy chit-chat during the scriptural talk time. Different people from the church are asked to prepare these little talks and it felt like no one was really listening. I had some trouble with this one. I expended a lot of energy trying to absorb new information, be polite in my reactions, and not let how different it was get to me. And in some ways, it was strikingly different. There were three separate hour-long portions. First the sacrement meeting, then a doctrinal lesson, last a male/female segregated session. The middle hour made me feel the most uncomfortable. It was a class of women and a couple of older men, but it was taught by 18year-old-looking guys who were referred to by everyone as ‘elders’. It is hard to describe how weird that felt. I don’t have a problem with male teachers or young teachers. But usually teachers have professional training. This felt like kids telling me what to think and how to think it by virtue of the fact that they were male and raised LDS. The lesson was mostly something I’m going to call ‘prescriptive spirituality’. There seem to be a lot of parts to LDS that are prescriptive regarding metaphysical things. (Do this and this happens. Say these words at this time in this place and this will happen in the afterlife.) The entire lesson was regarding the ‘sealing’ of families in a temple so they would remain intact into the afterlife. One can also seal families posthumously if the need is discovered. This is why genealogies are important, or so we were told. I know my own faith tradition is weird, but I’m struggling with how weird I felt hearing this stuff. Then the last hour, the women only group, was actually not very weird at all. It felt like any gathering at all the progressive protestant churches I’ve been to. We all tried to share ways to reach out and be good to others; to gain understanding and offer support. Everyone from their different lives offered different perspectives. It felt really normal. I hate the fact that I had to describe it as normal just there because the rest felt so strange. The young woman I talked to at this church was sweet and earnest. She’s a missionary from California and apparently that means she’s a greeter for newcomers to the church. She wants everyone to join the church. I’ve never quite felt like I fit anywhere, and I could never fit with this group either. I hurt sometimes and I don’t know what my life is doing. I shared something of this sentiment with my new friend. I think I hurt her. I left her without an answer for me. Sometimes I wonder if my project is becoming my journey to sadden others. I was (intentionally) implying it is silly to decide not to sin based on how it makes Jesus feel. Jesus and God, and even the Holy Ghost being almighty, can handle themselves, I reasoned. They don’t actually need me to protect their feelings. I got a reply to this post disagreeing with my statement and asserting that we do not sin primarily because sins are against God and therefore the pastor was correct. Still I find I have to disagree with this line of thinking. I happen to believe we are not following what God says simply because he said it. I believe God is a God of love. I believe he cares about us and wants us happy, contented, and well-taken care of. This being the case, I think God established a set of rules for us NOT because he likes arbitrary rules, but because those rules actually help us all to be happy, contented and well-taken care of. I think sin is not ultimately about disobedience. In my understanding of it, sin is about causing harm to ourselves, another human, or another piece of God’s creation. I think we have the ability to see that it is better for us not to sin, and I honestly think God prefers us to think about why we are doing a thing vs. just doing it OR ELSE. Another way of looking at this might be to consider what it would look like it we did assume all God’s rules were arbitrary and to be followed without question just because God said so. I read a news story about a man who was drenched by water after being swept away in flooding during Superstorm Sandy. He took refuge in a nearby (evacuated) house. To gain entry he broke in. Once inside he left a note explaining that he took only blankets, was suffering hypothermia, and feared death. In the strictest sense, this man destroyed property and stole. Would this be considered a sin? If obedience to the rules is our means of determining rightness vs sinfulness, I think we have to say yes, this man did sin. I am not comfortable with that and I don’t think I’m alone in my assessment. I contend that when we excuse this behavior we are using our understanding of the reasons not to sin rather than simply seeing sin in terms of obedience to God’s instructions. I’m really on-board with the idea that God gave us brains so we could think, and I’m a fan of doing that. In the end, I just don’t think we avoid sin to please God. I think we avoid sin because it makes things more awesome for everyone and that just makes sense. So I’ve actually been inside this church before. It was for a youth function back when I was more involved with youth groups. The service this day (and in summer) was held in a small chapel off the main sanctuary. There were probably between 20 and 50 people in attendance. Music was good, being provided by acoustic guitar or pipe organ (the chapel had its own organ!) The group songs went through every verse and nearly everyone was singing, which I happen to like. I mean, if you’re going to sing, why stop at verse two? The last thing in my notes was a prayer wish that on the edge of the possibility of war we all remember to see each other everywhere as people; brothers and sisters. It’s a good wish of ever I heard one. Problems/Improvements: None I can detect, besides the vague feeling of uncertainty implied by the sermon. Is this church’s future in question or was I just reading too much into an introspective sermon? It’s time I compiled a list of churches I’ve visited in alphabetical order by church name. The number after each church is NOT a ranking, it refers the order in which I visited them and it is meant to help you navigate my archive. I would link them all, but my website doesn’t seem to like that. **For further explanation of churches with no denomination, see individual church posts. I try to give explanation when possible as to church origin and philosophy. *Notice lack of #12? For this one I attended not a public church but instead visited a religious community in Albany called the Bruderhof. The group has a house on Washington Park. They do allow visitors, but they like to be sent a request ahead of time. It is their home after all. Pastor: Usual pastor seems to be named Reverend Smart. On this day we heard a guest pastor; Reverend Jimpson. On this day I found my way into a pre-service coffee hour and talked with a few friendly people. During the service they have a visitors greeting time called “warm welcome”. I got smiles, handshakes and hugs. The teen sitting directly in front of me turned immediately to give me a big hug which made me super happy. The musical instrumentation included drums, guitar, sax, and organ. I’m seeing a trend in churches with predominantly black membership; the music is often more modern and upbeat, falling into categories more like rock and jazz. Many denominations from European traditions use older, more solemn styles of music. I think I prefer the modern. A piece I liked from the sermon was the idea of clearing away rubble in our lives. In particular, some items listed that we may want to be rid of included: self-pity, jealousy, and picking out single bible verses. This last one is interesting in that it suggests we shouldn’t rely on a bible verse alone without understanding the context around it. The point is one I often feel the need to make myself and it’s good to hear churches acknowledge it. Problems/Improvements: Both the website and the printed material had errors. The website states that church service begins at 11am, I was told in fact it has started at 10am for quite some time now. Also there was an event advertised in the bulletin as “lunch and a word” purporting to be some form of bible lesson with free lunch. The location and date were listed wrongly. Because of these errors I had to return on 8/17 to catch church, (having missed it entirely the first time a couple weeks prior) and was unable to attend any sort of lesson they may have had accompanying lunch. I signed a petition- fight hunger! I’m better at biblical trivia than some churches! 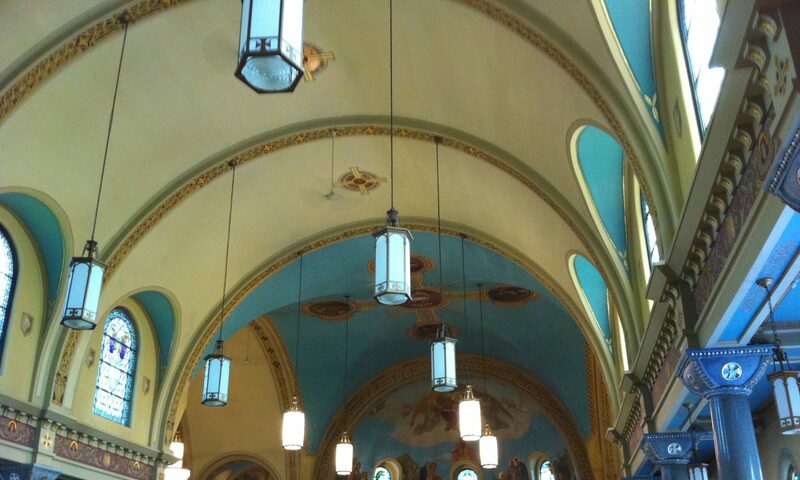 41) St Francis of Assisi Delaware Ave- I was told by the deacon the church has gay membership. Get it together regarding website, Presbys! 49) New Horizons- the end is near! 56) St Tim’s N. Greenbush- ELCA doesn’t disappoint! Making sin right should include considering those outside ourselves hurt by the sin. Christianity often seems to miss this key component in getting wrapped up in fixing the sinner’s relationship with God. And now we’re pretty much up to speed. I’m feeling the need to evaluate the project again as a whole. Interestingly, my limit before I want to do this seems to be 30 churches. I decided to re-read all my posts to find out what I’d forgotten about the visits, if anything. After visit #30 I came across the post about how I needed a break to contemplate the project. So that’s helpful, since I can now expect to make it to 90 then take another look back. Opening post: My rules have changed a lot. I was so optimistic. What happened? Also did I cause a dust up over atheists and article 13? 10) I forgot how happy Delmar Reform made me. People there were so relaxed and chill. * I drove by The Chapel recently only to discover they finally put up a sign listing mass time. Did I have anything to do with that? I make the most killer argument against condemning homosexuality! 16) Slingerlands UMC, wow, great sunny Methodist service about David’s Ducky. So much to write! 22) Great vibe over at First Congregational. Pastor seems very introspective. Two posts on good and evil- can good exist in the absence of evil for comparison? If we made a paradise would forgetting evil make us revisit it? Another pretty awesome piece about Scrooge only realizing his error when it was pointed out that has underpayment of Bob Cratchit sentenced a young innocent to death (Tiny Tim). Repentance of ignorance. Freakin amazing Star Trek parallel. I’m on fire baby! 25) Immac Cathedral- how do these people fellowship? Superstar takeaway- we all have it in us to commit violence. We all kill Jesus. So that’s notes on half #1 of the project. I was learning a lot along the lines of theologies. In retrospect, I was understanding Christianity as far more similar to itself than I now understand. I forgot several interesting or amusing things from the visits. It’s nice to revisit the different things I wrote and see the positives again.